For Etymotic, it’s always been neutrality and accuracy. Aside from in-ear monitors, they’re also known for making hearing aids and they’ve been doing this for a long time. That gives you an idea that they really know their stuff. In this review, we will be showcasing the Etymotic HF5 which sits under their flagship ER4. I would say the HF5 looks sturdy overall. The cable is not super thick but it is thicker than any in-ear monitors that I’ve owned. I also like the feel of it and it does not seem to tangle much. It is terminated by a ‘J-shaped’ plug that is beefy. The overall cable quality is very nice and appears to be durable. The housing of the drivers is quite long yet thin and they sort of stick out on your ears. The part where you put the tips is also long and very thin but I don’t feel it can break easily. Still you might want to be extra careful when putting the tips in. The sets of accessories are decent but then again I have a used one which comes with almost nothing but the carry case. Still, the complete package includes various tips like triple flange tips, foam tips and glider tips. It also comes with the filter removal tool, extra filters and of course the carry case which is gorgeous looking. The earphone itself is not as gorgeous though. These isolate like nothing I’ve ever experienced. As mentioned, this earphone requires deep insertion which might be uncomfortable for some depending on the mold of your ear canal. Once you do, then it really blocks out lots of outside noise. Etymotic claims that it attenuates 35-42 db of noise and I think the numbers are very close to that. As I don’t have the other tips, I cannot comment on whether others perform well versus some but I might edit this article in the future if I happen to have my hands on other tips. This is where this little thing excels. When I first got it, I expected it to be sort of thin-sounding as some people suggest. However I did not find it to be the case (maybe it’s a preference thing). I should mention again that this earphone requires deep insertion (proper seal) or else you won’t get the best possible sound. When you do seal it properly, you will get a good overall balanced sound. The bass is I would say is just neutral or for most people, a tad bass-shy and I definitely can understand that. I think this is my only earphone where I got a bit surprised that the bass quantity that I’m used to hearing to isn’t the same. It extends fairly low into the bass and it’s super tight but there’s simply not much quantity that would make you stomp your feet when listening to music that demands it. The midrange is very good. Unlike some other ‘neutral’ headphones where the midrange is recessed, this is not the case with the HF5. While the low-mids is slightly lacking body, the rest is quite articulate and there is even a very mild emphasis on the upper midrange. What this does is give the vocals an extra weight but in a very pleasant manner. It also makes it ‘clearer-sounding’ as the upper midrange emphasis also warms up the lower treble. Still, it is very far from a mid-centric headphone and I wouldn’t call it warm-sounding either. The mid to upper treble is more laid-back than I expected however keep in mind I was sort of expecting this IEM to be really bright so in context, it really isn’t laid back in highs. In fact, it has one of the best treble responses that I’ve heard for an IEM as it’s neither sibilant nor harsh. It’s just perfect to my ears. I should mention that the detail retrieval of this earphone is superb. Hearing small details of the tracks that you haven’t heard much before sounds cliche but it really is the case with this. I like listening to Dream Theater and I was blown away with the amount of details that I’ve rediscovered when listening. It has a fast decay which allows you to hear things quite separately as opposed to being whole. The disadvantage about not having too much bass quantity becomes an advantage here as it exceptionally retrieves small details in the lower frequencies. It doesn’t move a whole lot of air in the lows but it’s more of a limitation of balanced armature drivers. Soundstage is of course small but it is wider (yet lacking height) than most in-ears I’ve heard. Layering is very good but this makes this headphone critical of the source. Play a 128kbps track and there’s a good chance it wouldn’t sound good. This might not also be the best earphone to use for modern RnB and pop music as it may not be satisfying enough in terms of rendering the ‘oomph’ and ‘booms’ of the music. This plays plenty loud out of any music player but if you want to increase the bass quite a bit you can probably use a dark-sounding headphone amp although I have not tried that myself yet. In the end, this is one of the headphones that will ultimately be judged based on preference. Would it be comfortable enough for you to have something inserted deeply into your ears? Would you be able to stand that for a long period of time? If yes is the answer to both then great! 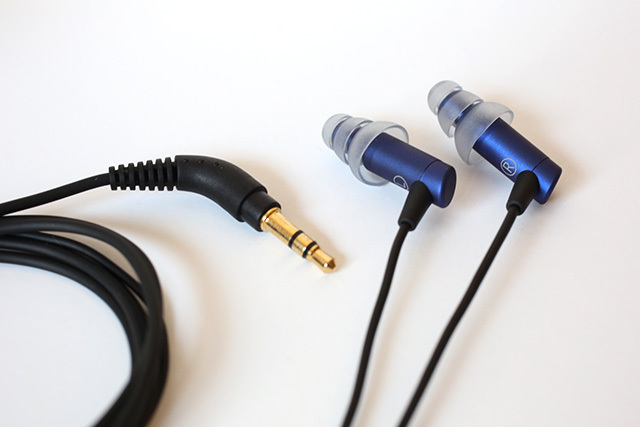 As for sound, if you’re good with not getting too much bass quantity, then you’re going to be good with this IEM. Otherwise you may want to look for other options. Overall, I am more than happy to recommend the HF5 as it sounds good and has amazing detail retrieval for its price. Check out the Etymotic HF5 on Amazon.